Digi-Schlock: FINAL EXAM (Scream Factory Blu-Ray) – Schlockmania! Scream Factory has built its success on relationships with a variety of production and distribution entities: for example, it has released special editions for a lot of films owned by MGM and Universal. They recently extended this kind of partnership to working with other home video companies by picking up the blu-ray release rights for a few films previously released on DVD by Code Red and Scorpion Releasing. 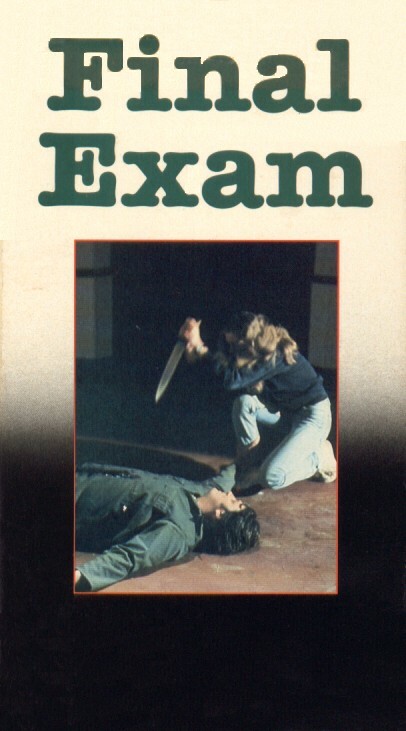 Final Exam is one of the films that emerged from this deal and the results do well by this cultish slasher flick. The transfer used for this disc looks quite impressive, offering a well-mastered rendition of a small-budgeted yet skillfully shot film. The muted early ’80s color scheme looks richer than past standard-def versions here and the clarity of detail is pretty impressive. The audio part of this transfer offers a lossless version of the film’s mono mix. The results sound fine, adding a little extra depth to the effective Carpenter-clone musical score. This disc also includes a few extras created for past editions of this title. The biggest is a commentary track that originated with the now out-of-print BCI DVD version of this title. It features cast members Joel S. Rice, Cecile Bagdadi and Sherry Willis-Burch as well as moderators Julia Marchese and Deron Miller. The track is a relaxed, informal yet informative affair, with Marchese driving the process with a steady stream of questions. Don’t expect any major bombshells but you’ll learn a variety of interesting trivia, like how the castmates sang “Another One Bites The Dust” every time someone had to film their death scene and the physical/technical acting rigors of shooting those death scenes. Marchese drives the track with plenty of questions, energetic if perhaps a little overenthusiastic about this film’s influence on the horror genre. She has also has some interesting, offbeat theories about the film’s killer and even offers up her premise for a sequel. Miller is a subtler presence by chimes in with the occasional observation, like how the film’s lack of interest in its killer’s identity is part of its appeal to some fans. There are also a trio of brief interview featurettes for Rice, Bagdadi and Willis-Burch, all in the four to seven minute range. There is a lot of overlap between the commentary and these pieces but the participants are able to add some extra bits of information to flesh out their commentary stories, like Willis-Burch revealing how her work for MPM’s producers led to her being cast in the film or Rice’s tale of how and why he transitioned from acting into producing. The package is rounded out by the original theatrical trailer, which makes the film look a lot more like a typical slasher than it actually is. All in all, Scream Factory has put out a nice-looking version of this lesser-known slasher item and those who missed out on the BCI DVD will be happy to see its commentary track revived here. If you’re a stalk ‘n slash obsessive, it’s worth adding to your blu-ray shelf. 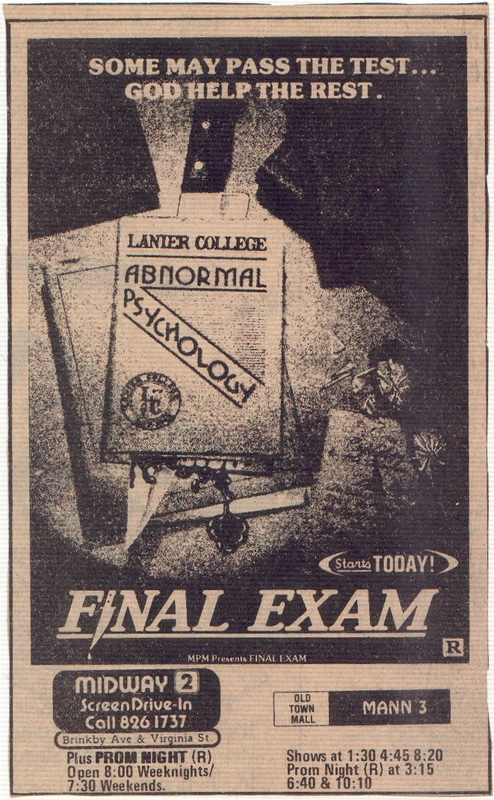 To read Schlockmania’s film review for Final Exam, click here.